This printable basic math addition worksheet generator will provides plenty of math practice, boost test scores and prepare the child/children to meet the Kindergarten, Grade 1, and Grade 2 curriculum standards. 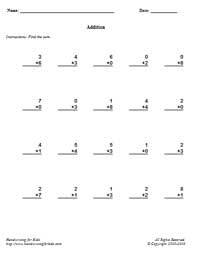 This math worksheet maker will create a vertical math addition, 1 digit by 1 digit (1x1) equations. Follow these steps to make your worksheet. 3. Click on submit to make your personalized vertical math addition worksheet. 4. Option: Page back and click Submit to create a different set of math problems.